Will the U.S. Help Britain with Its Terror Probe? Will a Spanish Judge Bring Bush-Era Figures to Justice? Despite the outcry it has prompted, the Administration was absolutely right to declassify the Department of Justice-CIA interrogation memos. The argument that the letters compromise national security does not hold water. 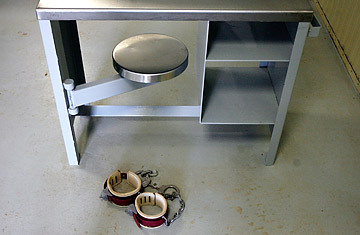 As noted in the memos, the interrogations techniques are taken from the military's escape and evasion training manuals, known as SERE (Survival, Evasion, Resistance and Escape)  which in turn were taken from Chinese abusive interrogations used on our troops during the Korean War. If there is any doubt the techniques were already in the public domain, released detainees have more than detailed the abuse interrogation techniques they were subjected to. On a more public level, a thorough clearing of the air will go a long way toward discrediting the idea that we either torture terrorists or die. This false choice is played out week after week in the popular TV show 24, leaving people with the notion that had the FBI somehow caught one of the hijackers in the hours leading up to 9/11, torture would have led to the arrest of the other 18 before those planes took off. We need to put the last nail in the coffin of Harvard law professor Alan Dershowitz's idea of torture warrants.